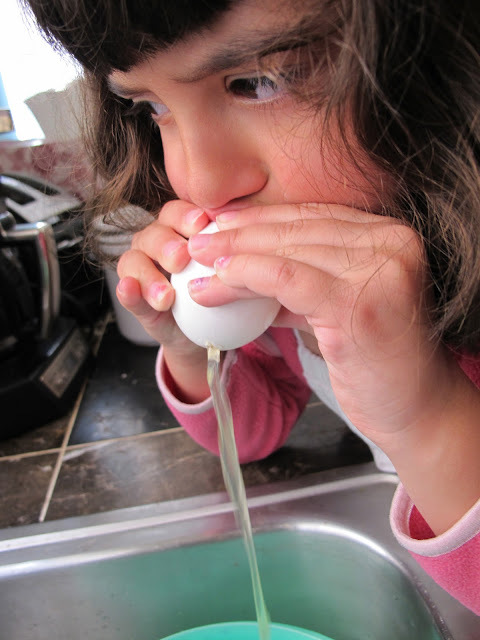 This year I decided to make cascarones with the kids for Easter. We usually have them for the Day of the Dead, but they ARE eggs... so I think they really should be for Easter, too! Traditionally, they are filled with tissue paper confetti, but I filled mine with large sequins because they are just more fun. First step is to blow out your eggs. Gently make a small hole in one end of a raw egg. We used a corn cob holder, but you can use a nail or a thumbtack. Anything with a small sharp point. Then the yellow will break and come out! When you think you have blown out all the insides, you can carefully enlarge the hole at one end. It's better if you help the kids do this part. At this stage, rinse out your eggs with hot water. Next, you can color the eggs or leave them plain and paint them later. We dipped ours in the dye bath for our Easter eggs. Set them aside somewhere safe to dry out. When the eggs have dried completely, it's time to fill them. 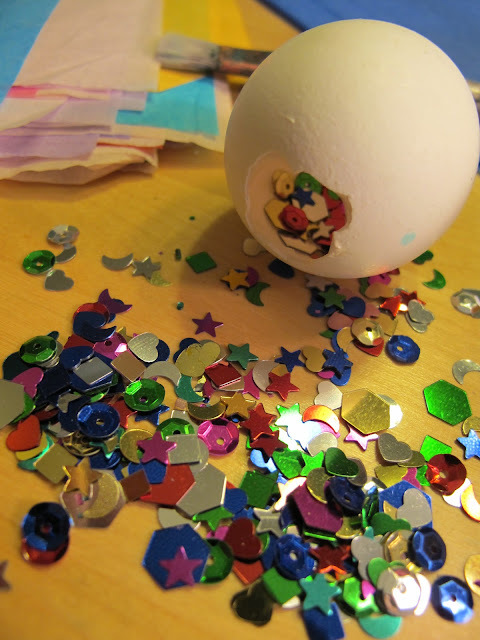 Use sequins or confetti, NOT GLITTER unless you hate the person you are going to crack the egg on! Put about two big pinches inside the egg. You don't have to seal the small hole on the top. Take some Mod Podge and paint around the opening of the egg. Lay a small piece of tissue paper over the opening and press the edges down. 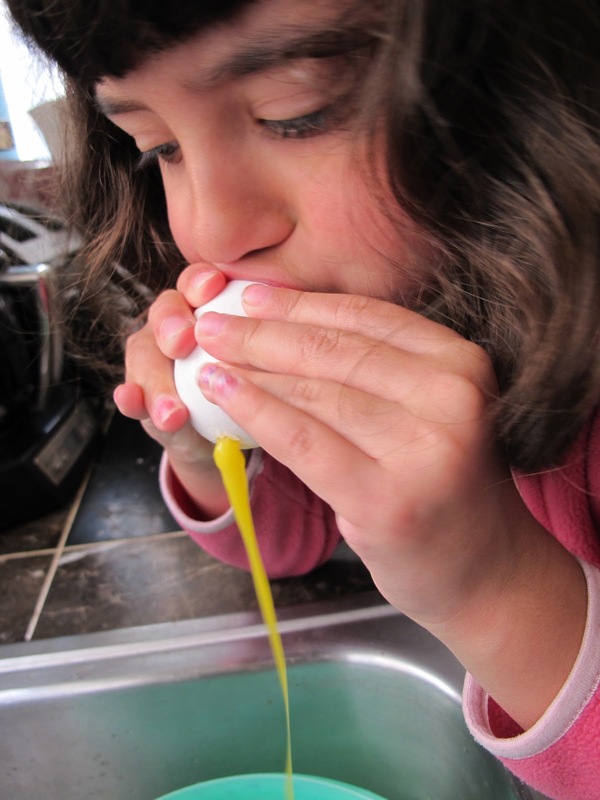 Use the paint brush to press down the tissue paper over the egg shell. Avoid the opening so the tissue paper does not tear. And don't use too much. I used the Shimmer Mod Podge because it has a pretty gold sheen to it. Set aside to dry or paint with a thin layer of acrylic paint if your eggs are not already colored. Resist the urge to decoupage more tissue or paint heavily on your eggs. You will be cracking them on someone's head and layers of Mod Podge or paint will make the egg harder to crack. Remember when you crack it on someone's head, give it a little squeeze with your hand so it cracks more easily. Having one cracked on your head is supposed to bring good luck, not a headache!